Mix the cumin, coriander, paprika and black pepper in a small bowl. 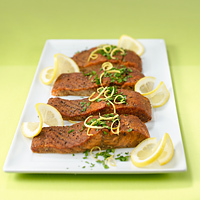 Cut the salmon into 4 pieces and coat the strips with the cumin mixture. Place a large skillet over medium heat and add the canola oil. Gently place the salmon in the hot skillet and cook for about 5 minutes. Turn the salmon over and cook the other side for an additional 3 to 5 minutes until the fish is cooked through. Note: Salmon may also be grilled or broiled. Place the salmon on a plate and sprinkle with cilantro.